RaAM's newsletter no. 21 is out! 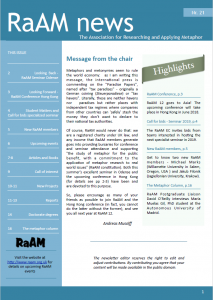 It includes a message from the Chair, n update on the RaAM 2018 conference in Hong Kong, a new "Metaphor Column", a Call for Bids for the 2019 RaAM seminar, and much more!